Greer's OC | The latest in fashion, dining, and trends. Here’s a hot tip to make certain that you will indeed meet Ina and get a book signed. Buy your book now at pre-sale for $35, and have it available at will-call. The store will open at 8 a.m. Friday and plan on getting in line early. Ina will only be signing from noon to 1:30 p.m. 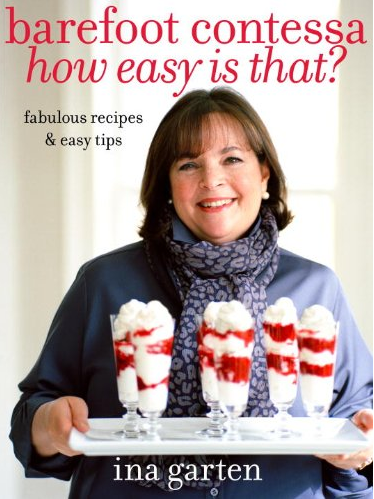 Since we were lucky enough to get an advanced copy, we can tell you this book is a must-have for your kitchen. Ina takes in to account the craziness of our lives and focuses on simple yet delicious dishes that save valuable time, money and minimize stress. Our favorites so far are the watermelon and arugula salad, the chicken with shallots, spicy turkey meatballs, and the French toast bread pudding. As you read through each recipe you can almost hear her calming voice, and charming laugh reassuring us that all will be good in the kitchen. She’s not one to make you labor through time-consuming, complicated recipes that require a boatload of ingredients. She’s the master of creating no-fuss dishes that taste and turn out fabulous every time. We say buy two copies, one for you and one for a holiday gift. It’s one of the best gifts you can give a neophyte to a seasoned cook: a collection of recipes that will become favorites forever. Level 1, at South Coast Plaza in Costa Mesa. 714.751.1166. Try your luck for a worthy cause. The 4th Annual Ante Up for Autism is going all out this year for its mission to support and provide resources for families touched by autism. The premiere “Gala and Casino Night” at St. Regis Monarch Beach on Saturday starts at 7 p.m. for general admission (red-carpet entrance starts at 5:30 p.m.). Join special celebrities, professional poker players, sport stars and attendees for a fun event to gamble the night away. The event will offer a VIP red carpet entrance, cocktails on the resort lawn, tournament poker, a live and silent auction and tips from poker stars. Pro athletes attending include Scott Niedermayer (retired Anaheim Ducks hockey player), Jim Everett (former NFL quarterback), Brian Lopes (world champion cyclist), Lolo Jones (Olympic track and field athlete), Felix Sanchez (Olympic gold medal hurdle winner), Jim Gott (retired professional baseball player) and Ernesto Fonseca (motocross racer). Tickets cost $250 for general admission; $750 for poker tournament (includes general admission) and $1,000 poker tournament plus general admission (couple). Tickets are on sale now at www.anteupforautism.org. For more information, please contact Violette Prentice at 949.640.4401 or e-mail at violette.prentice@tacanow.org. St. Regis Monarch Beach Resort & Spa at 1 Monarch Beach Resort in Dana Point. Join Orange County Rescue Mission on Saturday, April 27 from 11 a.m. – 1 p.m. for the inspiring Kids on a Mission, OC Children’s Business Fair. CBD Oil has become one of the most sought-after plant medicines and supplements in the natural health and beauty industries. For many people, CBD has been instrumental in dramatically improving their lives.